Today has been the longest Monday ever. It’s hot, windy, raining off and on, and Ryan has been very hard to manage. Everytime he has 2 seconds unsupervised he is opening windows and throwing stuff out them. First thing this morning it was all the lounge cushions and TV remotes. Each time he says “Sorry! 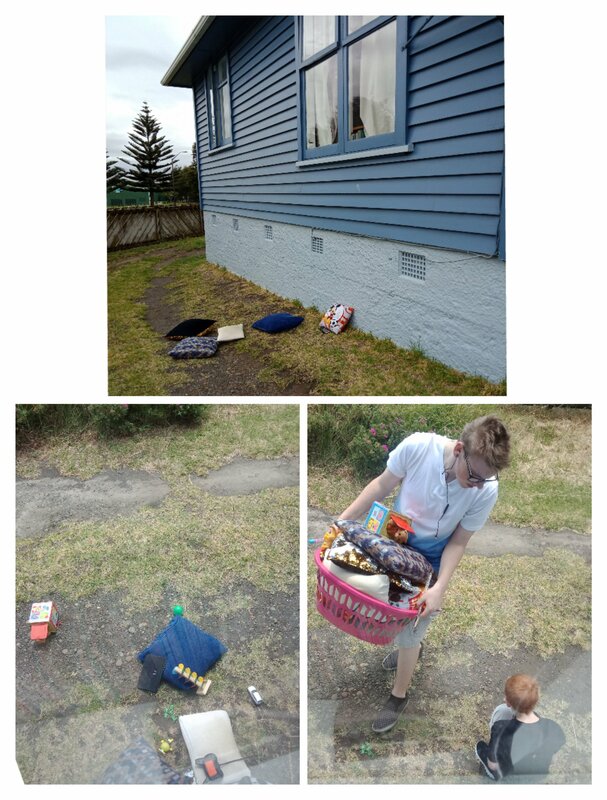 It’s not good to throw things out the window. Dad will be very angry when he gets home.” but then does it again. I was getting very angry/frustrated/annoyed when I came across a facebook post of another mum feeling similar, and she was reminded that “behaviour is communication”. I realised that Ryan was possibly bored and/or wanting my attention. So we spent the afternoon playing games and doing things together with no further incidents. 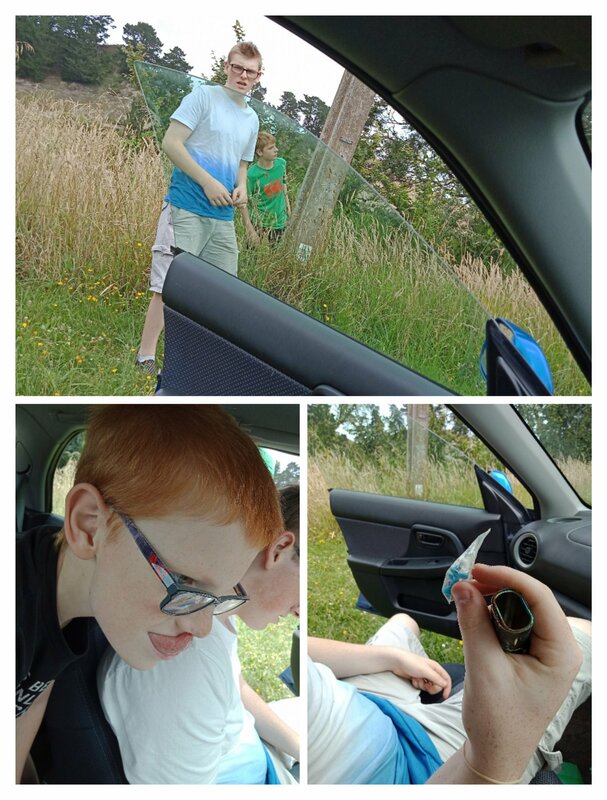 I decided a drive would be a good idea so I put him in the car, made sure his door was kiddylocked, checked there was nothing in arms reach he could throw, turned the music up and we went for a long drive to find a geocache. Ryan was quite happy to be off for a drive and he gets excited when we say we are going geocaching. Alex found it quickly and Ryan saw a smurf toy was in it. David signed the log and we were off home again. Ryan asked for a bath so I ran him a very deep one and it took him ages to empty it, one cup at a time, into the bathroom sink. But I stayed in sight the whole time as he was acting very unpredictable. Sometimes when he is very calm I can fold washing or make a coffee (within earshot and only a few metres from our bathroom) but I wasn’t risking that today. 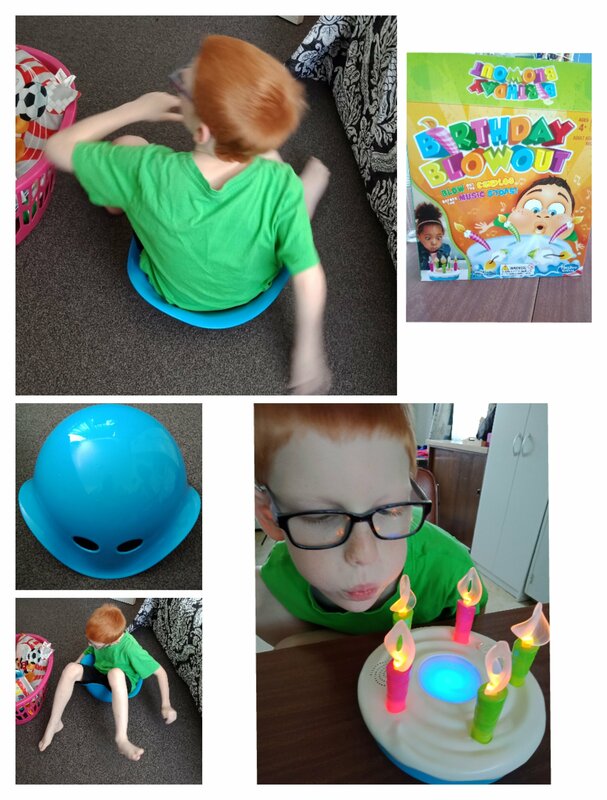 When he was dressed I got out a new game my brother brought him for Christmas called Birthday Blowout. After we put batteries in it Ryan had a great time blowing to make the candles spin and the lights (flame) go out before the music stopped. A very cool game! A courier came with a parcel from xtreme imports kapiti. I had brought Ryan a Watsit. It’s a plastic thing that is basically whatever the child wants it to be. Straight away Ryan sat in it and spun 🙂 Great fun! 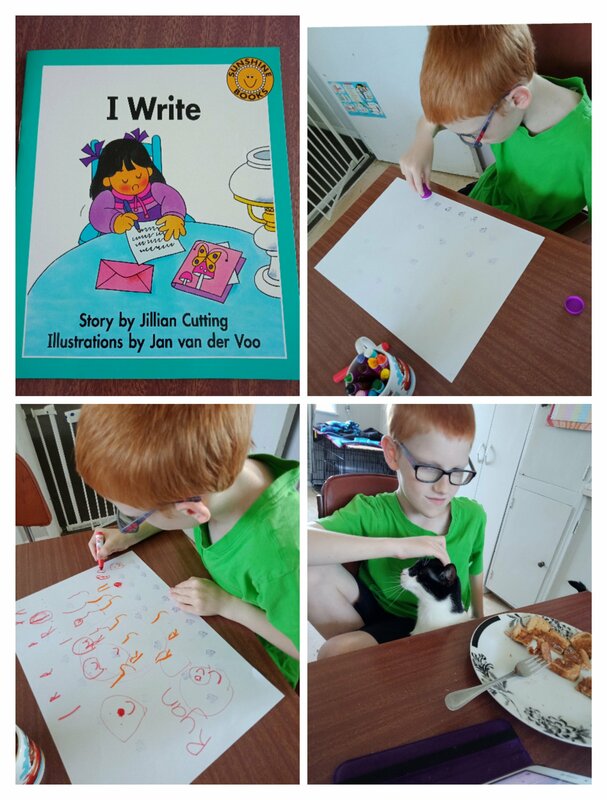 A new early reader called ‘I write’ was today’s new book. And then I gave Ryan some a bee stamp, crayons and paper. He spent a long time drawing and writing his name, while I cooked his dinner. A friend came to pick something up and I raced down to answer the door, hoping he would stay eating and watching Mr Bean. But somehow he ended up with whipped cream in his hair courtesy of a cheeky teenage brother lol. Ryan was very hungry at dinnertime and ate well. Havoc came to sit with him. He was ready for bed not long after Stefan came home. Well actually, to be honest, I was ready for him to be in bed so tuck in was a bit earlier tonight. He will probably get up a couple more times, and he has spent over an hour calling out from his room but hopefully he falls asleep soon.